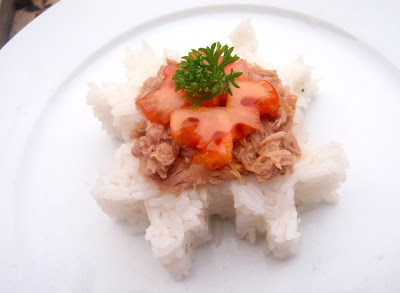 The girls are on vacation and today for lunch, they absolutely insisted on having rice with canned tunafish... :-( I tried to make my own dish a little bit more exciting using my rose-patterned cutters! Les filles sont en vancances et à midi, elles voulaient absolument manger du riz avec du thon en boîte... :-( J´ai essayé de rendre mon assiette un peu plus attrayante avec mes emporte-pièces en forme de rose! This is just so great! It makes me smile no madder what kind of food that gets into the 'hands' of these cutters! Love your blog, though I do not often leave a comment.